The retaining of captain Cesc Fabregas and much of the core of the side means Arsenal have an attack to mount a serious title challenge. So what has pre-season taught us of Arsenal so far? That the Gunners, through all their ability to weave patterns around the opposition, still tend to overcomplicate things despite obvious attempts by the manager to introduce more directness to the play. And that at the back, a sudden inexplicable nervousness is prone to kick in at any time which contrives to throw open a game. But we already knew that about Arsenal. In fact, on the face of it, not much has changed for Arsene Wenger’s side however on the pitch, conscious efforts have been made to better last season’s third place finish and Champions League Quarter-finals exit. 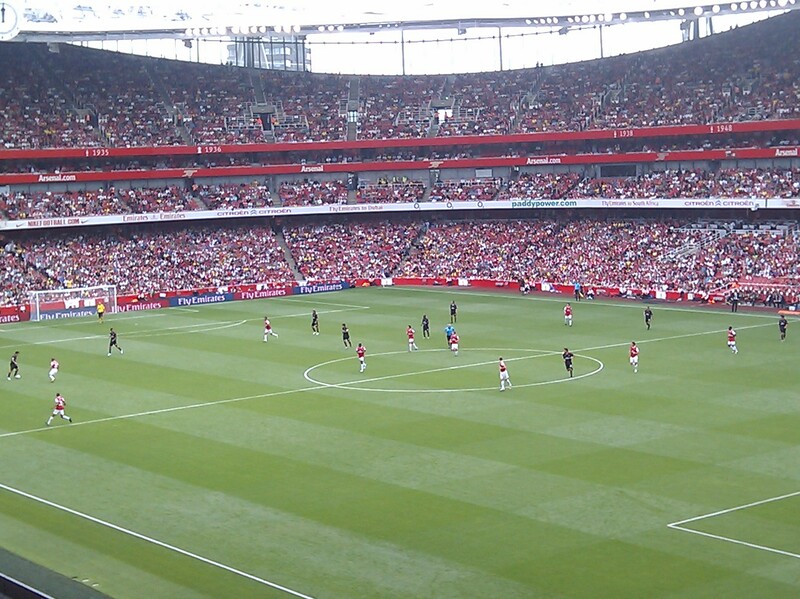 The last friendly fixture – a 6-5 win over Legia Warsaw to commemorate the opening of their new stadium – displayed both sides of Arsenal’s brilliance and frailties but despite the performance, it has been a solid pre-season for the Gunners. Because whatever assessment you make of Arsenal so far, it must be taken into account of the fact that the majority of minutes were played by a limited selection of players – many of them youngsters – with Jack Wilshere and Emmanuel Frimpong starting back-to-back Emirates Cup matches before the trip to Poland. Indeed, Alex Song, Denilson, Abou Diaby and long-term absentee Aaron Ramsey are four midfielders who would have added greater structure to the side while in attack, Nicklas Bendtner is still injured and the two most important players in Robin van Persie and Cesc Fabregas have just returned to training. Keeping Fabregas has been the best news of the summer for Arsenal who may be disappointed they haven’t been more active in the transfer window having only added one more defender to the side and lost four to the Bosman rule. It is perhaps the only area which lacks depth (this will be talked about in more detail in part 2 of this article) because in the forward and midfield positions, the Gunners look a frightfully potent side. Arsene Wenger has made a slight change to his 4-3-3 formation – essentially a continuation of last season’s structure – to add more balance to his side. The left-sided central midfielder is asked to drop deeper alongside the holding midfielder so Arsenal are more guarded in transitions and can press better. In pre-season that partnership was between Wilshere and Frimpong and the pair mightily impressed the manager with their mature tactical understanding in the centre. The most interesting role, however, was played by Samir Nasri and expectedly will be one that is assumed by Fabregas when he returns, in behind the forward. 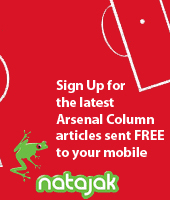 The question is do Arsenal have the structure to allow Fabregas or the ilk to revel? Excuses have been made of the expected consequences of such an expansive style and a team so young but aspects of Fordism such as discipline cannot go amiss. Abou Diaby is often noted that such deficiency but at the age where Wenger feels the team can push on, 23, it will be intriguing to see how his ability to turn defence into attack finally gets together. It’s not just in the middle where exciting changes are being made. Andrey Arshavin is anticipated to have an even greater impact at wide left with Wenger offering the opportunity more than ever to link up with the forwards. Theo Walcott can put World Cup woes behind him by giving Arsenal a more orthodox and penetrative threat from the right while Carlos Vela seems to have come back from South Africa with more zest. New signing Marouanne Chamakh offers not just a more direct focal point in the attack as van Persie played last season but with the much of the play being shifted out wide, provides an outlet for crosses. His movement, particularly to the right opens up different channels of attack with Walcott moving inside from such moments in pre-season or Rosicky dropping deeper. Jay Emmanuel-Thomas has impressed Wenger in a roaming forward role in pre-season and either of the front three positions is where he is likely to play. With Arsenal, the same caveats always apply but with more variety in attack, this is an Arsenal side which should challenge for more honours this season. 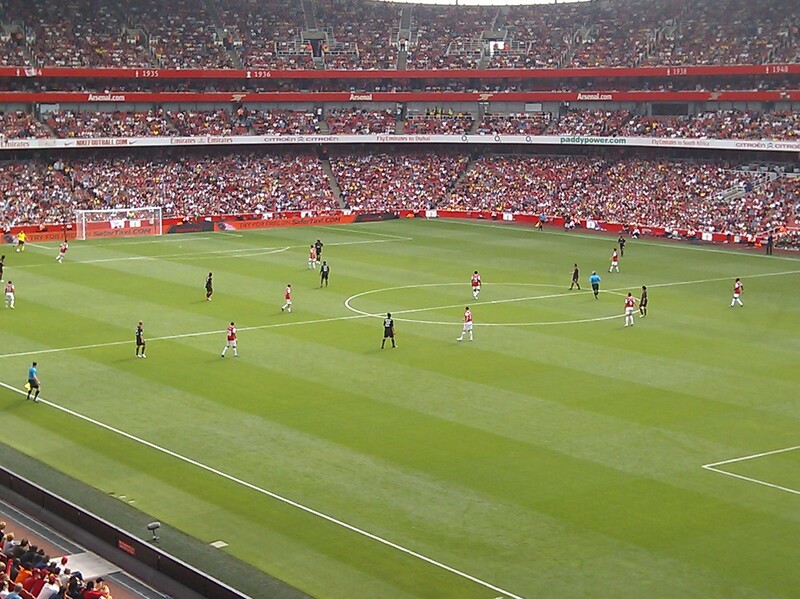 <Figure 1>Arsenal 1-1 AC Milan: Chamakh presses goalkeeper Abbiati with Nasri and Arshavin in close attendance to mark the nearest passing option. The shape is a 4-2-1-3 with Nasri given a free role. Here he presses as the second striker. <Figure 2> Samir Nasri’s freedom is displayed on a number of times in the draw with Milan as this time he drops into midfield in help press. Indeed, a similar structure can be attained in attacks as Wenger granted Nasri the ability to roam and on many occassions, the Frenchman played closer to Chamakh. Why are two holding midfielders so crucial in the modern game? I too feel that we have more variation in attack this year. 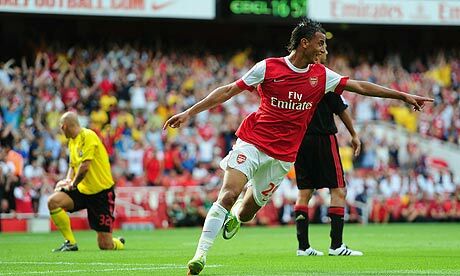 The movement of chamakh and walcott off the ball will cause defences a lot of problems. I hope the defensive strategy develops and we become a solid unit. who cares about attack? we need to be able to defend first. Sadly, we will be punished defensively. Too late to rectify problems. Not really worried about the attack, its the defense that worries me. We only have 3 CB’s , Djourou is injury prone , Koscielny needs time to adapt , and that leaves us with Vermaelen who has a lot pressure on him to keep things together at the back. So you can’t go into the season with just 3 CB that’s just suicidal, especially with all the injury’s we normally get. And lets not forget the 2 clowns we have in the goalkeeping position. Good article brain.i’ve always maintained in terms of attack we have an embarassment of depth.manc/chavs are clamouring for özil but we easily have cesc/diaby/nasri/rosicky/wilshere who can play there.if chamakh can give us what ade gave us i’ll be very happy.theo’s off the ball movement is devastating when he plays together with rvp/cesc/AA/tomas since they can spot him early.vela has looked promising.diaby can make llegada runs from deep giving us a variety of options!! !not forgetting eboudinho!…but we know footy is a game of attack and defence.if only we would had a stronger unit in defence too…anxiously waiting part 2! Arsenal always succumbed to pressure especially teams that uses tight marking system. The Arsenal players seems lost at time. Sad to say they never improve on this aspect at all over the years. A lot depends on Song and Diaby. If those two start slamming into tackles a bit more then we can set a more dominant tone, wear tough teams down sooner than the 80th minute and get 2-0. Last season we took too long to score and I am hoping this was a problem of being too young to feel able to impose themselves. Sooner or later they won’t be too young and hopefully it’s not a problem of personality. Actually we did this early last season. At the start of the season we did have two DMs and we played something similar to 4-1-1-1-3 and the deepest lying midfielders were covering left/right . Last season we started with Song-Denilson-Cesc which i feel is our best midfield. I looked at the guardian passes song and Denilson were playing predominantly playing on one side. Then i think Denilson was injured , we had to play with Song after that Song was missing for few games and Denilson was never fully fit again. So this double pivot is not something new. Who cares about defence as long as we score more than them. also rotation, if cesc needs a break, rosicky and nasri can fill his void. then there is also diaby and denilson who can play one of the roles next to song. but even that wont stop us from bringing the premier league back to where it belongs! So much for Man City having to leave out a dozen players, Bellamy, Ireland, Jo and Caceido are about the only notable players left out of a 23 man squad submitted to Uefa. Probably means another 2 players over the age of 21 coming in, Milner and who? We need to sort out the defence I really worried!! Even though Liverpool were not the best last seasion with torres and gerrard it will always cause us problems.we can start we a defeat which disasterouis for the start of the seasion. Has much has I love frimpong and whilshere to play a part, but starting the lack expirience. Both havnt started for arsenal in the premier league. For both to do it away at Liverpool,with a new manager Liverpool looking to impress we need,denilson or song or daiby to start. But in arsene we trusts he probably got master plan going, and cesc played 45minute for Spain tonight so u never know!!! I think Diaby is one who has barely been mentioned but will play a huge role for the gunners next season. If song and diaby stay fight for most of the season that is the cover cesc needs. When cesc plays diaby is a different plauyer. He was huge last season when cesc was in and that combo with song behind them was responsible for both the good runs in the league! That frees up the attacking positions for rotation with arsharvin nasri (who looks really up for it) walcott Vela and Van Persie in the wings and Chamakh VP and Bendy up front! A defender would be real handy and it obviously will happen (sooner rather than later please Arsene) and a GK wouldn’t be too bad otherwise i would like to see Woz in goals. But like someone else said lets just score more than them! 3 players should not be in the first 11 if we are going to dominate the EPL. Walcott is still headless when he runs and making decision, speed alone do not make you a good player, he is maybe only effective to be used as a sub. Seeing him to start a match really a eye sore to me. Diaby is a time bomb is he is used as a DM. He oftens try to dribble in our own half when is so dangerous when he loses possession, and he would lose it quite frequently. His tiny brain does not have storage space to remind him he is operating as a DM when he is needed. Denilson, the worst of all as he shows no skill, no speed, no desire, no sense of positioning, a hopeless so call footballer. He should retire from football. WTF what an idiotic artilce, get a new brain, yours is a waste. This teams wins nada, nothing, zip, zero, just like this fecking bs article. We will still concede 40+ goals in the PL thus rendering the attack irrelevant.